Time division multiple access (TDMA) is a prominent access method for shared channels in industrial wireless sensor networks with their strict timing requirements. Each sensor receives a number of recurring timeslots for packet transmission with the advantage being that multiple nodes can transmit concurrently if the physical properties of the network preclude interference. 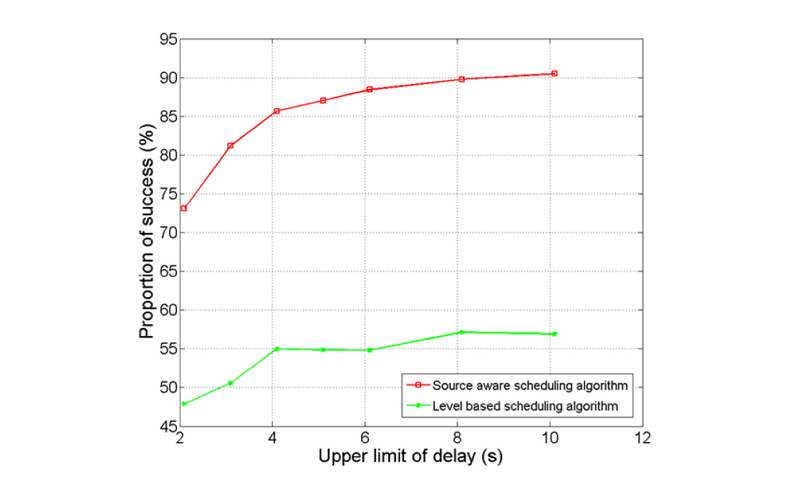 Scheduling algorithms for the assignment of sensors to timeslots under quality of service (QoS) guarantees such as throughput, delay or fairness, are required. We proposed a source aware scheduling algorithm (SAS-TDMA), which is a cross-layer solution and designed to adapt to the network dynamics in industry environment. The SAS-TDMA algorithm makes a trade between the scheduling length and the scheduling configuration overhead incurred by a rapid response to topology dynamics. We have implemented a TDMA stack instead of the default CSMA stack and have introduced a cross layer for scheduling algorithm in the TinyOS simulator, TOSSIM. Numerical results show that SAS-TDMA performs well in improving the QoS of the whole network. Compared to existing scheduling algorithms, which aim to achieve the minimum possible latency for real-time communication, the SAS-TDMA has achieved significant improvements in realistic dynamic wireless networks. 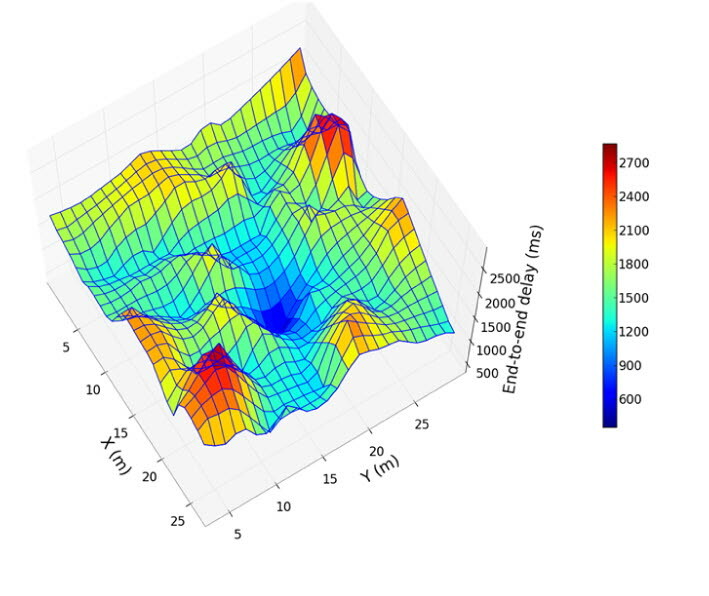 SAS-TDMA was simulated in TOSSIM, which used a log-normal radio model with real-world parameters and had the ability to capture the dynamics of wireless links, under these conditions: 1) 100 nodes to be scheduled in a single cluster; 2) all nodes apart from the sink transmit data at 2.1s-10.1s without exceeding the upper bound of latency; 3) high-noise environment that incurs high network dynamics. The obtained results clearly demonstrate that SAS-TDMA outperforms the level-based scheduling algorithm, which is one of TDMA scheduling algorithms which have not taken into consideration the adaptation to the network dynamics. 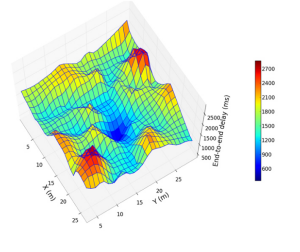 The figure shows a 3D diagram of end-to-end average delay variations over 30m by 30m terrain for the source aware algorithm at 3.1s rate. The root node is located in (15.68m, 17.59m). The maximum average delay is 2972.38ms from a node located in (22.73m, 6.94m), while the minimum average delay is 1103.66ms from a node located in (19.52m, 19.49m). The following figure shows that our method is much better than the level based method in industry environments. Noise and interference make a substantial impact on wireless transmissions in industrial environments, resulting in frequent erroneous packet deliveries. Automatic Repeat Request (ARQ) and Forward Error Correction (FEC) improve the reliability by introducing retransmission and redundant information in the original data respectively. Together with researcher in Mälardalen University and ABB, we propose a MAC layer FEC scheme for improving the reliability of multi-hop IEEE 802.15.4-based IWSNs and show that it achieves a significant gain in performance, compared to uncoded transmission. The proposed scheme is backward-compatible with the IEEE 802.15.4 standard, into which it may be integrated smoothly. Furthermore, it allows the nodes not running FEC coding to participate in the network, as well. The error-correction is performed only in case of error-detection. Packet decoding and processing in intermediate nodes are avoided in case error-detection check is successfully passed. Since the data integrity is checked on-the-fly, the traffic resources are freed from the transport of corrupted packets, paving the way for more reliable data transmission with lower latency, both for single-hop and multihop networks. A experiment for assessment of the proposed approach on three mesh topologies, Each topology comprises a single sink and 26 randomly placed nodes, reporting their measurements to the sink every 1 second over a Rayleigh fading channel. The obtained PDRs the number of decoding function calls for three different network topologies are presented in the following figure. 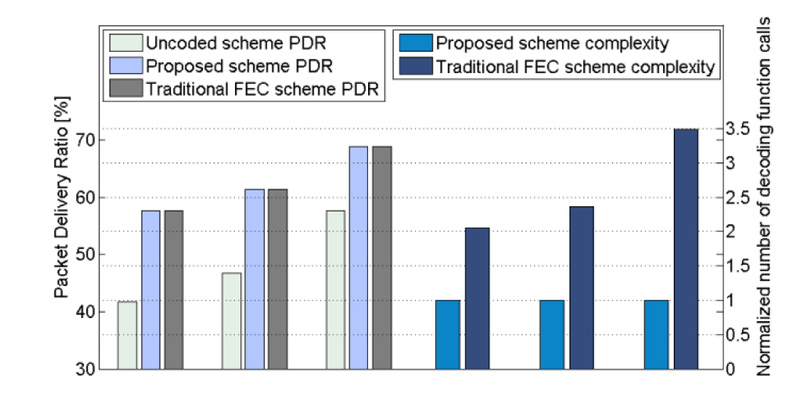 Compared to the uncoded scheme, the proposed solution in all three topologies shows a significant improvement in PDR. Namely, the absolute improvements in PDR are between 11% and 15%, compared to the uncoded system. In terms of relative improvement, the communication reliability is boosted by 19%-38%. Since the results from three different network topologies exhibit the same trend, it follows that a significant improvement of transmission reliability can be generally achieved by our proposed scheme. The variation in PDR between the topologies is the consequence of different nodesink separations. The average distance between the nodes and the sink in Topology 1 is the longest, whereas in Topology 3 it is the shortest. Accordingly, the overall PDR from Topology 1 is lower than in Topology 2 and 3. The transmission distance is highly correlated with the received SNR, and, our solution becomes fruitful for SNRs above 4 dB.